Demotix: Mario Mitsis. Some rights reserved. The House of Commons last night voted to bury Tony Blair. Listening to the debate it is quite clear that everyone now accepts he deliberately misled the House of Commons over Iraq in 2003 - everyone includes those who voted with the government motion, including the Prime Minister and his Liberal Democrat deputy. No one will now deny that Blair took the decision to support the US invasion well before the Commons vote ten years ago and the rest was a shameful manipulation of opinion. I always try not to use vicious, personal and crude Blairite language but in this case the pleasure is too great: Blair is toast. An official investigation into the Iraq war took place called ‘The Chilcot Inquiry’; so long ago now that few can remember when it opened and then closed its doors. Its report is trapped in the phantom zone. There are reasons to believe that Cameron colluded with Blair to keep it there, as David Owen has cogently set out. Now, frankly, it can remain there, it is no longer needed. We all know Blair lied. It is official. The Prime Minister doubtless had to talk with Blair about his Syria policy. Blair himself demanded military action, the warlike rhetoric of the supposed Middle-East ‘peace envoy’ thankfully hidden behind the paywall of the Murdoch empire. He apparently published his drivel while hopping from super-yacht to super-yacht, gloriously captured by the Daily Mail. Doubtless he will be drowning his sorrows with a massage while leaving a message with Obama to preserve Britain’s ‘influence’. The heir to Blair that has suffered most is David Cameron. Despite the huge differences from Iraq and a genuine use of WMD his attempt to follow his master was uncanny. The specific scenario that upset the Commons was: 1) a rush to follow and participate in American action, 2) while pre-empting a UN decision, 3) precipitating a military collision, 4) with no clear or convincing idea about the outcome, 5) in a cloud of moral rhetoric. The parallel was so exact that its advocates spent much of their time trying to persuade everyone that ‘this is not Iraq’. It was telling that last night Blair was trending higher than either Cameron or Miliband on Twitter. 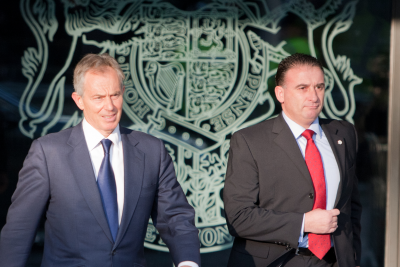 Did Blair assure Cameron that Labour would be squared to support him? After Ed Miliband withdrew his potential agreement that the atrocity in the Damascus suburb of Moadamiyeh called for the UK to support an immediate US retaliation, Cameron suddenly found himself alone with his own backbenchers in a way that Blair had not been with his (over half the Labour back-benchers voted against the Iraq war in 2003 and the vote for war was carried by Tory support, including David Cameron’s). Staring at defeat Cameron weakened his motion to include a mealy-mouthed concession to the UN process and then added a clause saying there would have to be a second commons vote before any actual military action by the British. When I heard this I thought that yesterday’s debate was therefore pointless. In fact the wording of the government motion supported the need for a strike against the Assad regime as of now, the second vote was, in effect, a matter of timing not principle. This seems to have become clear to MPs as the debate, and the day, rolled on. A master of public deception, Cameron is much less able to take in those close to him who have watched him at work. By the end of the debate the bluff was not even being bothered with. The Lib Dem leader Nick Clegg said in his summing up, “The sole aim is to relieve humanitarian suffering by deterring and disrupting the further use of chemical weapons. Nothing more, nothing less. Not invasion. Not regime change. Not about entering Syria, into the Syrian conflict”. This is indisputably a Blairite call for the use of force as a shaping punishment. The more he insisted on what it wasn’t, the clearer it was what it was. No one pretended that the Commons wasn’t actually taking the decision that mattered and Cameron’s ruse failed. It may still be that Miliband will be persuaded into supporting military action and he carefully left the door open for this. But the bellicose unilateralism and total support of American military action that marked the days of Blair was buried. He thought that the British leader who was closest to the White House would always be elected in the UK, that the road to electoral success in Britain ran through Washington. We will see. Finally, the only Labour resignation was one minor shadow minister who stated he could never, ever, support any military action even of the kind Miliband’s statement permitted. No one broke from the opposition's ranks to back Cameron and Clegg as Jack Straw did over secret courts. Or mentioned David Miliband, who went into the same lobby in support of war in 2003 as Cameron. Had he won the Labour leadership the most direct of Blair’s heirs would surely have sought and supported a government motion backing the United States, unlike his brother. The political media class has still far from forgiven Ed Miliband for upsetting their choice as Labour leader but it is even clearer today that the trade union members who tipped the balance made the right call. In so far as it goes, of course, many will be plotting revenge. But the presumption that when it came to the wire "war and the White House' can always impose itself on British politics has been exploded.